The Pearl Links East Course is a beautiful parkland layout and designed by famed architect Dan Maples. 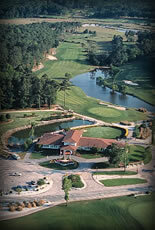 This course winds its way along the scenic Calabash River 20 miles from North Myrtle Beach golf courses. A golfer may face difficult challenges from hole to hole while soaking in the breathtaking views of the natural scenery. Golf Digest gave the East Course a 4-star rating as “Best Places to Play” in the area. The 17th-hole is one of the signature holes and boasts nearly 400 feet in length! Strategically placed salt marshes make the East Course just the right amount of challenge. The 17th-hole leads up to the ultimate setting- the final challenging hole. Easily the 18th-hole finishes with an apex! Pearl Links East Course is a par-72 and has plenty of excitement around on the fairway around every turn. A spectacular view of rolling greens captures the essence of golfing. Soft spikes are required while golfing on MiniVerde Bermuda greens. The Pearl Golf Links is one of the well sought out courses of all the golf courses along the Grand Strand. The course offers many discount golf packages for your next golf vacation. Hotels in Myrtle Beach are just a short drive. Book your Myrtle Beach golf trip with us and discover affordable golf vacation packages and door busting golf deals. Played both sides & course was in good condition. East course is a very good layout and usually in good shape. Staff are very friendly. If you're in Myrtle Beach area it's worth the drive. Roads need some repair. Workers inside we're not very friendly. Not a bad course. Too far to drive from Surfside Beach. Not a bad course. Too dark to drive from Surfside Beach. Although it was cart path only, we enjoyed our round. Course in great shape. Nice course...greens were ok...very slow. We had much better conditions on other courses we have played this week. Need to change to Champions Greens. Too many ball marks, balls literally plugged on the green. Narrow fairways. West Course is Great, and the Club is great. The staff was completely professional, quick, courteous, and got us out on the course quickly. The West Course is set up well, with challenging but fair pin placements. All 18 greens were in good shape, a little soft but they ran true, were smooth, and had good speed. The Fairways were cut well with tight lies. If you find the rough, it can be challenging and often requires a layup to stay out of trouble. Overall the course is set up to make you think from tee to gree. Its a beautiful course, highly recommend playing if you get the chance. Completely unprofessional course staff. At 6:50pm, we were set to tee off on the last hole of our round. The golf pro physically blocked the cart path and would not let our group finish, stating that we would not be able to finish before 7pm closing time. Attitudes like this are why the popularity of golf is tanking - do not give this course your business. The most unprofessional golf course staff I've ever experienced. The staff yelled at us to finish up while we were putting on the 9th green with hours of sunlight left to play. With the amount of great courses in the area I will never return to this course. Do not give this course any of your business. I was visiting the area for the 1st and only time. The Pearl was a nice course. As a public course, I would rate it a 7 /of 10. There are 36 holes. I played the West Course. There was an outing on the East Course. There was a "beverage cart" which rolled past about every 15 minutes...reasonable prices. I would definitely play there again if in the area. The Pearl Links East Course is a beautiful parkland layout and designed by famed architect Dan Maples.